In bunny dreams, anything can happen. A bunny might know the A-B-Cs, or count by 1-2-3s. A bunny might find the perfect carrot. A bunny might hop, hop, hop . . . or even fly! 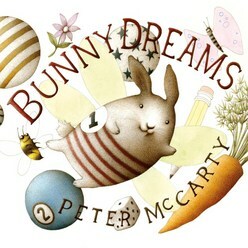 A new whimsical adventure from Caldecott Honor winner Peter McCarty!